Pets are part of the family; why not bring them along on vacation? Over the last few years, our team has noticed a huge spike in interest for vacationing with pets. Enhance your next vacation and bring your furry friend along for the trip! Renting a Wisconsin cabin, cottage, or home is the perfect opportunity to bring your pet along. RentWisconsinCabins.com is here to help plan your next vacation – we currently list 270 rental properties that are pet friendly!! From water front properties to awesome pet friendly nature trails – bringing your pet can only enhance your vacation experience. Doggy paddle – the first swim stroke that young children learn. 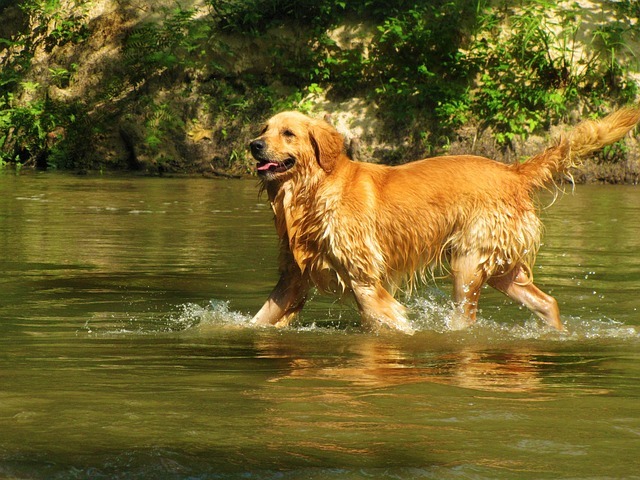 Just as vacationers love to splash in the water to cool off, so do our furry friends. This has become so popular that there are life vests for dogs! Enjoy a typical Wisconsin experience by the lake with your pup. Many of the vacation rentals in Wisconsin are near a variety of trails for you to enjoy. Did you know that Wisconsin State Parks allow pets? Yes! Pet friendly, on Lake Mary, 3 miles from Warren Close Dog Park, private pier, outdoor seating, hammock, gas grill, nature trails, and more. Pet friendly, on Schnur Lake, near Chequanmegon National Forest which is dog-friendly, screened-in porch, awesome fishing, and more. Pet friendly, on Big Round Lake, near Straight Lake State Park which is dog-friendly, gorgeous lake views, private fire-pit, various nature trails, unique shops, nearby restaurants, and more. …267 more pet friendly vacation rentals can be found on RentWisconsinCabins.com. Don’t let your pet miss your next Wisconsin vacation experience; bring them along! This entry was posted in Wisconsin Vacation Rentals and tagged travel, Travel with pets, Vacation rental, wisconsin. Bookmark the permalink. ← Wisconsin Vacation Rentals with Sand Beaches.